I loved it so much, I bought another one. Ok, so maybe I didn’t buy the same saw. I was the previous owner of a 1.75hp 14/12. It was an awesome saw, but one day I went to rewire it to 220 and discovered that I had to rewire the whole saw (outlet and all) to 220. I was kinda eyeballing the new 14bx and that was it. I posted my saw on Craigslist and said, if it sells I upgrade, if not, I keep the 14/12. Well, it sold in about a week. So here I am today, unloading the new 2.5hp bx. I feel the same way about this saw as I did my 14/12. As the previous owner of the 14/12, I didn’t really need the manual for assembly. The thing I can tell you is that it came with about 12 bolts to complete the assembly. Most woodworkers should find it very easy to assemble. The box was in perfect condition. The saw itself did not have a scratch anywhere and all the welds were very good (this is coming from a guy that welds). Jet should take note in this category on their band saws with all those nasty grinding marks that they think people don’t notice. The frame is heavy steel and doesn’t have any noticeable flex while handling. I was able to build a Portamate mobile base and lift the saw out of the box by myself.The large table has a really nice top grind to it and the dual trunnion set up is as heavy duty as it gets for a saw in this class. I use to cut 13” diameter logs on my 14/12 and the table didn’t move. The fence was dead on after a few adjustments that are now built in. I bought a Starrett 5/8” 3 tip skip tooth blade and installed it with the ceramic guides that I have grown to love. I owned my 14/12 fr 2.5 years and the ceramic guides were still in perfect condition the day I sold it. When you are aligning the blade, it is best to adjust the upper wheel with the tension off. Otherwise, you might chew through the adjustment knob in the back. It isn’t the heaviest built part of the saw, but adjusted correctly, will easily last the life of the saw. The brake system seems really nice. I ride mountain bikes, so working/ maintaining this should be a breeze. It has a small adjustment knob in the back to tighten or loosen the brake as needed. It def has enough stopping power and I see a set of pads lasting a very long time. I also like that it turns the saw off and soon as you tap the brake paddle, It is much easier to reach in the cutting position. In short, everything set up perfectly. I plug the saw into my 220/20amp outlet, yes this saw comes with a power cord installed, go to turn it on and nothing happens. I test all the buttons, brake levers, and safety switches and still nothing. I pull my voltage detector out and the saw is getting power until the motor. Ok, maybe I have a bad switch. I go upstairs, have a beer, and come back to play around some more. The problem was I didn’t pull the red safety button out all the way. I don’t normally pull on buttons hard because I’ve broken a few in the past. This one needed to be pulled out until you can see groves in the yellow plastic of the button. Once the saw was running, I ran an 8’ piece of ash through it and it didn’t show any signs of slowing down. There is no vibration whatsoever and my blade ran for about 45 seconds after turning it off without using the brake. I don’t know if they updated the dust collection on this saw but its much better than my old saw. I know they added a second dust port at the bottom of the body, but I didn’t even have my dust collector hooked up to that port during my cuts. Things I’m not crazy about: the light outlet is 220 on this. the adjustment knob on the back of the upper wheel is not the greatest quality, adjusting the ceramic guides isn’t the easiest (but Im 6,6” with XL hands), and the Starrett blade is not nearly as good as the 5/8” Laguna Shearforce that I had on my old saw but they didn’t have those in stock. In short, this was, as the 14/12, and still is as the 14bx, one of the nicest bandsaws I’ve ever used and it is easily worth the extra $300 over the cost of the 14/12! ... cut the plug off the light and connect the hot (black) to one of the hot terminals on the 6-15P plug and the white to the ground terminal. The magenetic light is bright, can be stuck to the table (pictured below) or to the spine of the saw. Congrats on the new saw. I am buying this saw as well. Hope to pick up in the next 2 weeks. I would have thought that the outlet on the side for light would be 110 and not 220. In Europe this would make sense because they run everything on 220 where as here we primarily use 110. Thanks for the nice review – and for addressing the voltage on the axillary outlet. I think a lot of people had questions on this. Limelight – using the ground for you neutral wire is NOT recommended and nobody should be considering this as an option. You will not get 120v from that outlet because there is no neutral wire. DON’T use the ground for the neutral. If you must have 120v auxillary, you will need to install a NEMA L14-20 outlet and put a new 4 conductor wire on your saw. And change the auxillary outlet on the saw to a NEMA 5-15 outlet. Great conversation about the outlet. Has anyone found a converter that will work for the lamp outlet? I really want to avoid buying Laguna’s 220 as I’m not crazy about the looks or having halogen bulbs. My house is almost 100%leds. And one additional bit, this saw easily passes the nickel test. Do you guys think this saw will operate well using a 15amp220 volt circuit? I have read that it is a 9.8 amp motor. Just don’t know if that is maximum load. misterbig, not sure about 15 amp. I can tell you that mine is on a dual pole 20amp breaker with 12awg wire. I’ve had no issues to date. 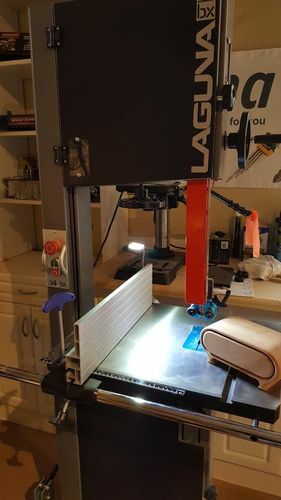 Just got the 14bx 2.5 two weeks ago and have to say this is one the nicest looking bandsaws I’ve seen. That said, I am a little disappointed with the flimsy construction of the tensioning and tracking assembly and also have concerns about the safety of the tracking capability. The tension lever, when disengaged, is very loose and flops around. I found the tension lever plate (part no. 23) had slipped down and eliminates any resistance on the bar and cam. Once I forced the plate back to where it should be, the slop was much less. Unfortunately the lever plate is only held in place by tension and has slipped down again. That is something I can live with but my main concern is trying to track the blade safely. It is not possible to turn the tensioning knob in a clockwise direction while the blade is under tension or even less than half tension. The only way to correctly set the tracking “on my saw” is to unplug power, release blade tension, adjust tracking knob, retension blade, rotate upper wheel to determine tracking and repeat as many times as it takes and then plug saw in and hope you got the tracking right. During this learning process the blade came off the wheels a couple of times, once cutting me, not badly but the potential is there. I’m a month shy of 62 and have used a lot of bandsaws in my lifetime and maybe I’m naive to think I should be able to turn the tracking knob with the blade under tension and not have to go through this wait/see scenario every time I change a blade. Maybe I just got lucky with all the other bandsaws I’ve used and was able to adjust tracking while the blade was under tension. I’m hoping this is just related to my saw and can be fixed because I really want to like this bandsaw for more than just good looks. I have been going back and forth with a Laguna Tools rep, removing and reinstalling the upper wheel and block assembly a couple of times trying to determine the cause but based on their latest response, I’m sensing they don’‘t have a fix. Just wanted to add that I sold my 1412 (that I had had for 3 years and was very happy with) for a very good price and bought a 14bx 2.5hp. I love the 14bx and I am glad I made the decision to upgrade. Bandsaw table was slightly crowned and so Laguna is sending me a new table. Laguna service was very responsive. I was unable to contact them by phone about my problem with my BX brake, so had to email, and I have to say it was one of the worst customer service experiences of my life. It went on for months, with every step taking over a week for a reply. The person I was speaking to would reply with single words after days of silences. He eventually stopped responding to me after asking for some pictures of my problem. I’d likely have much more luck speaking with another owner. This was after also getting their 16” sheartech planer.. Beautiful tool, but they had packaged it very very badly for shipping and the first was destroyed. The second took an age to reach me, and the dealer I’d purchased it through literally had to yell at them to get movement on it. The second shipment was also damaged. Clearly forklift damage, and it took them 4 months to get me a replacement cast iron bed that got dinged. A little less for a dented side vent from the same damage. Again, I really do like the tools, but their handling of problems is again, the worst I’ve ever experienced and as such.. I can’t buy from them any more. They were never rude at all.. Just unable to help.